This is no Nutella Brownie Cups but it is just as good, for those of you who do not like things too chocolate-y or sweet. Nelson got some white grapefruit from his vendor and he was kind enough to share them with me. Grapefruit isn’t a fruit that I eat, so I baked with it! I think it’s more interesting to consume it this way. 🙂 Enjoy your Thursday. Preheat the oven to 350 degrees F. Grease an 8-inch loaf pan with non-stick baking spray. Line it with a sheet of parchment paper leaving a generous overhang for easy removal; set aside. 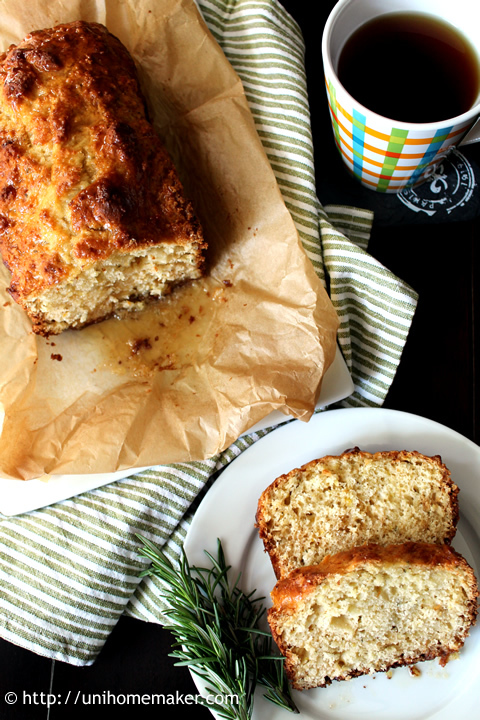 Using a stand or electric mixer (or mix by hand) mix together sugar, rosemary and zest. Then beat in eggs, yogurt, olive oil and honey. Mix until well combined. Add flour, baking powder, baking soda and salt. Mix until just moistened. Pour batter into the prepared pan and smooth the surface with a spatula. Bake for 40-45 minutes or until toothpick/tester inserted into the center comes out clean. Let the teacake cool completely on a cooling rack before removing from the pan. In a small bowl, whisk together grapefruit juice and powdered sugar. Adjust juice and/or powdered sugar for desired consistency. Pour glaze over the teacake and let it absorb. Slice and enjoy! One of my co-workers made a comment about how he liked it because it wasn’t overly sweet, but you can taste the natural sweetness from the grapefruit. I couldn’t agree more. I had this for breakfast with a cup o’ tea and it was a great way to start the morning. Grapefruit wasn’t too bitter like the ones i’m used to. That sounds such an interesting combination and a lovely looking cake with a great crumb. I’m not really a grapefruit fan though. I guess it would work with lemon??? Yes, it would work well with lemon! Meyer lemon, if you can get it. Citrus and rosemary are usually a hit. I have to try this cake! That would be such a nice breakfast treat. I would never have thought of that combination! Great idea Bee, I think I’ll make this for Mothers Day breakfast 🙂 Heavy on the glaze! Never seen white grapefruit before. Is it sweeter than ruby red? Looks great! Lovely pics. I would never thought of pairing grapefruit and rosemary. Great looking teacake. 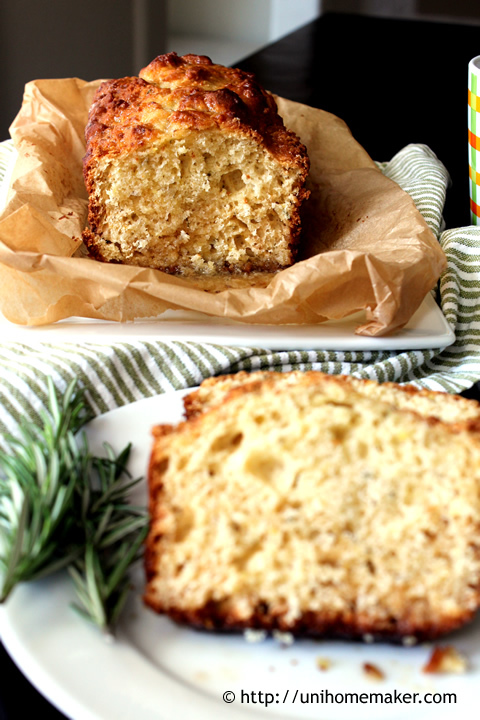 Can’t wait to try this cake – I love baking with rosemary, and this flavour combination sounds so good! Thanks Sarah. Hope you do enjoy it. Sounds and looks divine. I love the combination ofrosemary and citrus. Never thought to use it in my baking. Thanks for the inspiration. These look amazing! Love the flavour combination. What a fab flavour combination! Is the white grapefruit (that I’ve never seen) as sweet or as sour? And I do love the idea of that glaze. This was definitely on the sweet side and, in my opinion, tastes better than the red flesh grapefruit. My brother gave me these but I have seen white grapefruit in a farmer’s market like produce market when it’s in season. I love grapefruit and rosemary together! This combination sounds interesting! If each flavour is not too overpowering they would go quite nicely together. I don’t think it’s weird at all, I think it’s lovely! What a unique combo – I think it sounds delicious! I love baking with yogurt! Rosemary and citrus go so well together, Anne, why wouldn’t they do the same in a cake? I think it’s all about balance and it sounds like you definitely got it right here. And in my book, you just cannot go wrong with a citrus glaze. i’d say you’ve got a winner here. Thanks John! Always great to hear from you. 🙂 Hope you had a lovely weekend. I loved this bread. I loved it so much I pinned it as it is light and delicate and not overly sweet. I bet this would be lovely with a pomelo fruit too. What a combination! I love it already! because it is less sweet than normal cakes. I have not tried a cake with rosemary either. I would love to try making this. You got my attention at grapefruit! Looks delicious Anne! 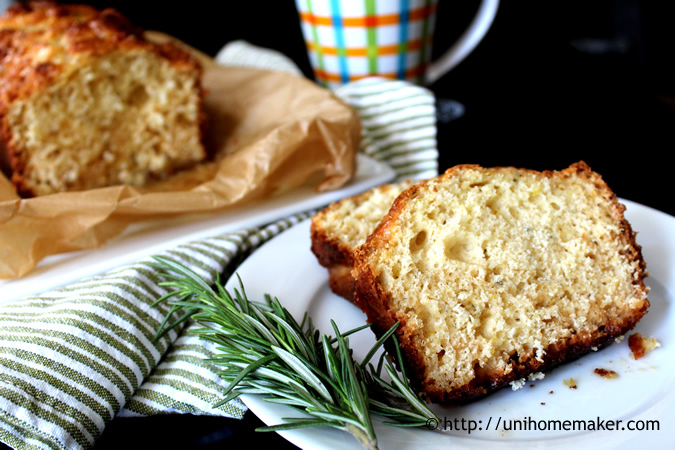 The teacake sounds good with the rosemary…a favorite herb of mine. Anne, I love the flavor combination. Never tried it, but I will definitely give this one a try! Thanks Sheryl! I’m still thinking about your chocolate biscotti. I think that’s a perfect pairing! Wish I was having this for breakfast today. YUM. Gorgeous combination in a cake! I can imagine the grapefruit-rosemary connection quite well as I had prepared some lemon curd with olive oil and rosemary some time ago. Since then I am convinced that citric flavor and Mediterranean herbs match very well. Love the fluffy look of your cake as well. Grapefruit in baked goods! I’m pretty sure this is my first time seeing that in the teacake or any baked goods I think. WOW I love citrus in baked goods, but didn’t think grapefruit can be an option. This is a brilliant recipe, Anne! What an interesting combination. Grapefruit really does lend a beautifully different citrus flavour to baked goods and I’m so curious to try the fusion of rosemary and grapefruit… thanks for sharing! Thanks for a spectacular recipe Anne. I made this for friends yesterday. It was very popular. My glaze turned out to be more of a syrup (in order to get the sugar/grapefruit flavour balance right). This worked really well when poured over each slice. I’m so glad you enjoyed it! Thanks for coming back to comment. Have a stellar weekend!